The monetary policy aimed at emptying the treasury of the Iraqi state is part of the plan to dispel the wealth of Iraq to continue the scarcity of cash from hard currency in order not to increase the value of the Iraqi dinar against the dollar .. because it is obvious whenever the reserve of hard currency increases in the state treasury whenever the value of the local currency increases. The Central Bank has been working for years over the sale of the dollar by selling the currency as it is known for the purpose of smuggling abroad by the powerful thieves and the largest part of it was going to the Iranian banks to increase Iranian reserves of hard currency to increase the value of the currency IRA The deficit in the Iraqi budget continues, so that there is no significant difference between the exchange rate of the Iraqi dinar and the price of the Iranian currency, ie, there is no difference in the value of the two currencies on which the trade is based, because in many cases of sale and purchase were in the Iranian Toman in the provinces of the south Especially Basra .. But after the impact of US sanctions on Iran, which led to a huge decline in the Iranian Toman, which led to a decline in the balance of trade between the two countries and the decline of religious tourism until the gap became deep and the difference between the large Iraqi and Iranian currency, To bring the remainder of the goods in Iraq to save the Iranian economy through economic agreements turned the balance of trade to zero in terms of Iraq to be a backyard and a consumer state for all Iranian products without exporting any Iraqi goods to Iran because the case of Iraq as it is known has nothing And the majority of its revenues go to Iran to cover its absurd wars here and there and the remaining enters the pockets of thieves in the form of salaries and privileges fairy .. Also within the dictates that are falsely called agreements are the cancellation of the fees of visas for Iranians to Iraq so as not to compromise Iran's work If we imposed the entry of 7 million Iranians in the seasons of visits and each person pays at least $ 20 visa fees to become the income of Iraq from the visits of up to $ 140 million this amount lifted from the mouth of Iraqis and entered the stomach of the sons of Iran as well as the establishment of the Iraqi state And the religious thresholds to spend on Iranian visitors and provide the food and service they need free of charge at the expense of Iraq, which caused the loss of economic double in order to enjoy the worship of the masses in the goods of Iraq .. The evidence of the above if we return to memory before the US embargo on Iraq where it was Budget of Dr The Iraqi nation is 11 billion dollars and the dollar exchange rate was 3.3 and today the state budget is 450 billion and the exchange rate of the dollar is 1189 dinars .. Who is responsible for this and for the benefit of ..
From the MOU that both signed recently, some of the infos in this article are no longer the case. The Central Bank has been working for years over the sale of the dollar by selling the currency as it is known for the purpose of smuggling abroad by the powerful thieves and the largest part of it was going to the Iranian banks to increase Iranian reserves of hard currency to increase the value of the currency IRA The deficit in the Iraqi budget continues, so that there is no significant difference between the exchange rate of the Iraqi dinar and the price of the Iranian currency, ie, there is no difference in the value of the two currencies on which the trade is based, because in many cases of sale and purchase were in the Iranian Toman in the provinces of the south Especially Basra . Folks, THIS is MESSED UP!!! AND The United States Of America Treasury (UST) HAS BEEN at the Bicraqi Iraqi CBI since January 2015???!!! AND the Bicraqi Iraqi CBI is COMPLIANT on Anti Money Laundering (AML) / Countering Financing of Terrorism (CFT)???!!! The question I have is, "HOW long can THIS go ON???!!!"!!! ALSO, "WHAT/WHO is HOLDING BACK the NECESSARY FIX to ALL THIS MESS???!!!"!!! So, MY (NOTE: MY) gut tells me THIS WHOLE DEAL HAS GOT TO GET RESOLVED NOW!!! WHY, pray tell, would THIS article be published NOW???!!! The Insanians TANKING the value of the Bicraqi Iraqi Dinar, NOT to mention DRAINING the Bicraqi Iraqi CBI, SO Bicraqi Iraqi Dinar is COMPARABLE in value to the Insanian Rial, er, TOMAN or WHATEVER???!!! Insanian work around of The United States Of America Sanctions WITH the FULL Knowledge Of The UST???!!! Isn't the Bicraqi Iraqi/Insanian trade FAR SMALLER THAN the Bicraqi Iraqi Crude Oil Sales in NONE other THAN the USD???!!! The Insanians are RUNNING OFF like BANDITS WITH USD AND PLUMMETING THE BICRAQI IRAQ DINAR VALUE!!! Praise the LORD for The True the United States Of America Patriot President Donald J Trump FOR Such A Time As THIS!!! NO WONDER THE PREVIOUS JCPOA WAS SO, SO SCREWED UP!!! NO WONDER THE SANCTIONS ON THE INSANIANS AND INSANIAN ENTITIES!!! The Insanians WERE allowed to fund THEIR Terrorist Machine by MILKING the Bicraqi Iraqi CBI, TOO!!! Well, OK, OVERALL, THIS is REALLY Good News, wouldn't YOU say???!!! WHY, pray tell, would THIS news be released to the Bicraqi Iraqi NOW to, potentially, HACK THEM OFF???!!! Oh, YEAH, Heat AND Sand Season IS Nigh Upon THEM???!!! THIS WILL get Good like REAL Good!!! Honestly, articles like THIS make me think AND feel, "Somethinz Gotta Change!!!"!!! My adrenaline HIGH is a mix of VISCERAL ANGER AND STRATOSPHERE EUPHORIA when I read stuff like THIS!!! The transparency of THIS article AMAZES me!!! Go Moola Nova (YEAH AND YEE HAW, BABAE', READAE' WHEN YOU ARE BROTHA (OR SISTA) - LET 'ER BUCK!!!)!!! Is this from a legitimate news source? I haven’t heard of Kitabat.com. Also, why would the Iraqis keep raving about their dear friends, the Iranians? That’s all the government ever says – “brotherly neighbors” and stuff like that. If this article is correct, and the Iranians are holding down the value of the Iraqi Dinar, wouldn’t the Iraqi government have known about it and been angry about it, instead of being so in love with the Iranians? Something has got to give sooner or later! Ah, The Crazy, Crazy News Of Late With The Bicraqi Iraqi AND The Insanians Wouldn't You Say, Floridian, AND The Very Best Of Your Weekend To You!!! So far, Rouhani’s winning. On a three-day state that ends Wednesday, he’s held a press conference alongside his Iraqi counterpart, addressed businessmen, visited important Muslim shrines and chatted with tribal leaders. So, Rouhani goes TRIBAL WHILE The True The United States Of America Patriot President Donald J Trump VISITS the EXCEEDINGLY POTENT The United States Of America MILITARY INSTEAD OF THE Bicraqi Iraqi, well, I guess You COULD call THEM, mutant screw head monkeys (as a VERY ESTEEMED site member refers to THEM - THANK YOU @10 YEARS LATER!!! )!!! NOW, WHO, pray tell, made the TRUE, CORRECT, AND COMPLETELY POTENT CHOICE ON WHO TO VISIT IN IRAQ!!! The True The United States Of America Patriot President Donald J Trump???!!! Well, OK, I COULD post a WHOLE LOTTA OTHER stuff I'm thinking right NOW about ALL THIS BUT better NOT!!! The STUFF is ABOUT to HIT the FAN!!! Deep State Actors to be "neutralized" in SOME form OR fashion on OR prior to Tuesday, March 19, 2019. The WAIVER on sanctions between the Bicraqi Iraqi AND Insanians ENDS on OR about Saturday, March 23, 2019. BREXIT occurs ON Friday, March 29, 2019. Basel III (or whatever) is SUPPOSED to be in effect Sunday, March 31, 2019. Well, OK, maybe BABY watch ALL KINDS of CRAZY NEWS BLOW OUT OF Iraq for the SHORT FUTURE???!!! And, as NEPatriotsFan1 said, I also like that list of dates! Iraq is another channel for Iran to avoid US sanctions on Iran. It has become clear that the economic sanctions are beginning to do its job directly and affect the performance of the Iranian economy in many areas . Rouhani’s visit to Iraq declares a clear trade and investment agenda , and is therefore a clear attempt to circumvent US sanctions and limit the Iranian economy from further tightening and suffocation. , Floridian, AND The Very Best Of Your Saturday To You!!! , Half Crazy Runner, AND The Very Best Of Your Saturday To You, Too!!! It REALLY floors me how the starting article is SO direct AND descriptive on HOW the Insanians HAVE BEEN destroying Iraq monetarily SEEMINGLY unimpeded WITH the FULL knowledge of the UST AND NOTHING is being DONE about THAT!!! SOMETHING(S) MUCH BIGGER MUST BE AT PLAY HERE!!! So, we see news sprinkled here AND there about the magnitude of the THEFT FROM the Bicraqi Iraqi CBI LIKELY MOSTLY during Ole Mr. Potato Head Nouri al-Maliki's EXTREME malfeasance of NOMINALLY 350 billion USD. 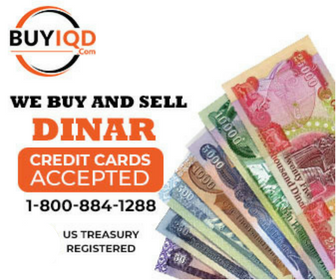 WHAT, pray tell, would the value of the Bicraqi Iraqi Dinar be with an ADDITIONAL 350 billion USD (or some SIGNIFICANT portion THEREOF) "hard currency" AT the Bicraqi Iraqi CBI???!!! NO WONDER Dr. Shabibi TRIED to ReInstate the Bicraqi Iraqi Dinar in 2013 to PREVENT THIS MESS WITH AN INTERNATIONALLY REINSTATED BICRAQI IRAQI DINAR!!! WHERE, pray tell, are the "POWERFUL THIEVES" getting THEIR POWER AND WHO, pray tell, are THEY exactly AND WHY, pray tell, have THEY NOT been DEALT WITH ALREADY???!!! OR are THEY ABOUT TO BE???!!! A FEW surprises "SUDDENLY" in the news about WHO THEY are???!!! Loving the news as of late...reserve of foreign currency is at its high. I believe the rate is way beyond than that of the glory days...and I don't think we may have to wait longer. Cheers n keep the positive thoughts flowing. Amen. I am with you guys. Iran propaganda is at an alltime high now. Dont listen to it. We are fine and in a great position.